David Ricardo’s theories were introduced in fragments in Japan after the Meiji restoration of 1868 and his work came into prominence late in comparison to other major thinkers figuring in the history of economic thought. The book seeks to analyse the studies in Japan from the year 1920 to the end of the 1930s – during the time before the outbreak of the Second World War, when even the study of classical economics became difficult. The book covers different aspects of his works and contains elements which may be interesting to foreign and even Japanese readers today without necessarily coming under the influence of Marx’s reading. 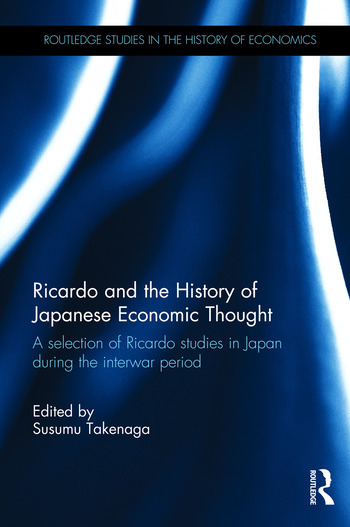 It presents works on Ricardo that are at present, wholly unknown to the Ricardo scholars and more generally to the historians of economic thought outside Japan. This book is an essential read on the history of economic thought in Japan. Susumu Takenaga is a Professor of Economics at Daito Bunka University, Japan. He had co-edited a book with Yuji Sato, Ricardo on Money and Finance: A bicentenary reappraisal, which was also published by Routledge.